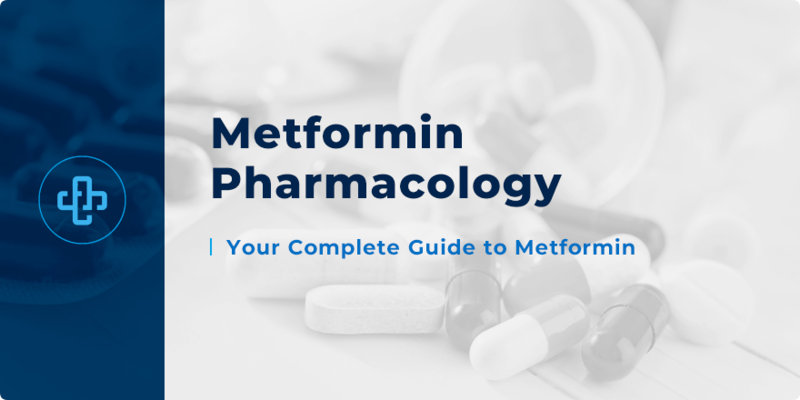 Metformin is the first-line agent in the treatment of type 2 diabetes. It may be used alone or in combination with other medicines, such as sulfonylureas or insulin. Metformin (Glucophage) is a member of the biguanide class of antidiabetic drugs. It lowers blood glucose levels by enhancing the sensitivity of insulin. Metformin achieves this by suppressing hepatic glucose production – glycogenolysis and gluconeogenesis. Along with the suppression of glucose production, Metformin works to increase the uptake of glucose by skeletal muscle. It also reduces intestinal absorption of glucose. One of the great advantages about Metformin is that, unlike other antidiabetic medicines, it doesn’t cause weight gain. This, in the long term, helps to control glucose levels even further. Metformin is also used to treat polycystic ovarian syndrome. A propensity to develop gastrointestinal side effects such as nausea, vomiting, anorexia, cramps, increased flatulence and diarrhea. Metformin is also known to cause taste disturbances. Metformin is also linked to the rare but potentially serious lactic acidosis. Long-term use of metformin is associated with vitamin B12 deficiency. Along with these side effects, there are many other clinical matters to consider. That Metformin is excreted unchanged by the kidney. This means its use should be limited in those with advanced renal damage and that a dose reduction is necessary in those with moderate renal damage. Metformin use should be withdrawn in cases of acute alcohol intoxication. Excess alcohol, along with Metformin, may precipitate lactic acidosis. In addition, use of Metformin should be used with caution in those with liver damage for the same reason (impaired ability to clear lactate). Certain drugs – such as thiazide and loop diuretics, and prednisolone – increase blood glucose levels. They therefore contradict the effects of Metformin. Gastrointestinal effects may be reduced if the medicine is started on a lower dose, increased gradually. Patients are typically recommended to take Metformin with or after food, with a full glass of water. Want more facts about Metformin? Join our member’s area today to receive instant access to pharmacy quiz questions, pharmacology flashcards, mnemonics, infographics and much more. Be sure to check back to our pharmacy blog in the near future for more great study tips!